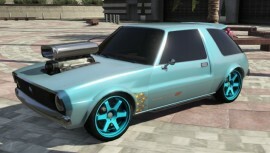 The Declasse Rhapsody is a 2-door hatchback in GTA 5 as part of the I’m Not a Hipster update. The Rhapsody is based on the 1975-1980 AMC Pacer (aka the Mirthmobile from Wayne’s World). 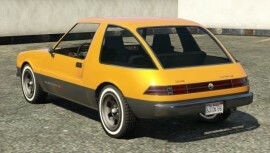 The sides and rear of the Declasse Rhapsody resemble an AMC Pacer, while the front bears similarities to an AMC Gremlin. The wheels appear to be aftermarket, bearing a resemblance to American Racing Ansen Sprint mag wheels. 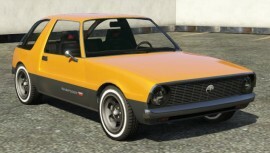 The car’s front fascia also resembles that of a Volkswagen Golf Mk1 (round headlights, badge in center of grille). It has large windows so it offers very little protection if the driver is being shot at, which could be a problem in Online sessions. The Declasse Rhapsody‘s performance is considerably poor, and while the car’s size and design makes it comparable to the Blista Compact, the Rhapsody’s performance is worse. In addition to an average rate of acceleration and a poor top speed (115 km/h), the car is considerably heavier than the Blista Compact, making it harder to corner and brake. However, the Rhapsody’s rear-wheel drive (as opposed to the Blista Compact’s front-wheel drive) and more reasonable torque that minimizes burnouts as power is applied to the power train. 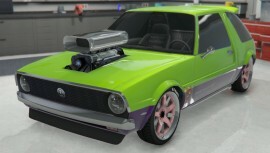 The Declasse Rhapsody belongs to the Compacts class of vehicles. In stock form, it comes with white sidewall tires. There are 17 mod categories. Among the available mods are Side Pipes, Fender Flares and Flames, and a Ducktail Spoiler. Side Pipes, Fender Flares and Flames, Spoiler. Found in each protagonist’s garage in single player. Spawns in Traffic (Xbox One/PS4). 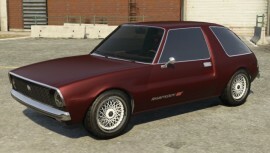 The Declasse Rhapsody can be bought in GTA Online from Southernsanandreassuperautos.com for $140,000.